No artist has control over how their music is received, and any work that catches on big will attract an audience that’s probably a good deal wider than its author intended or envisaged, and will likely include a whole swathe of people the author doesn’t really relate to all that strongly. 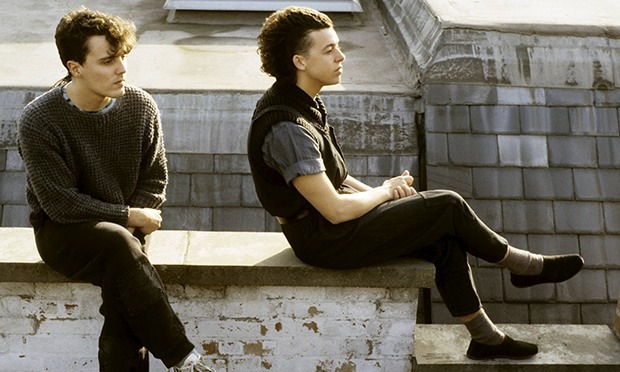 For proof, let’s look at Tears for Fears, at once one of pop’s most serious-minded, interior-looking groups and a shorthand for lol big 80z muzik. While I’ve known Everybody Wants to Rule the World since I was a child (and have liked the band since becoming consciously aware of who they were when Sowing the Seeds of Love came out), my response to it has changed a little over time, and I’m aware that how I take it, and what I get from it, is not the same as what someone else might. A few years ago I watched an old mid-1990s Adam Curtis TV series called Pandora’s Box. The League of Gentlemen, an episode that dealt with economics and the dangers inherent in treating it as a science, began with some footage of (presumably real) city workers in a karaoke bar, bellowing out the chorus of Everybody Wants to Rule the World, lagers in hand. OK, so the characterisation of all city boys as beered- and/or coked-up louts entirely deaf to the subtext and irony of what they were singing was heavy handed, but it made Curtis’s point forcefully enough (and I assume from the general tenor of his lyrics that Roland Orzabal and Curtis would find a reasonable amount of political common ground). And now, of course, I can’t help but see those two beery karaoke singers whenever I hear the song. Thanks for that, Adam. That’s the thing. Everybody Wants to Rule the World is a song so big, and so universal, that it can encompass many meanings, can mean almost anything to anyone, in fact. It can be a go-on-my-son nod of encouragement to the lairy and megalomaniacal, or a sigh of acceptance that, yes, this is how people are, and it’s confusing as hell, but we aren’t alone. It can be travestied by Lorde in her bewildering goth remake for a Hunger Games sequel, placed at the end of a mid-1980s Val Kilmer sci-fi comedy (Real Genius) about super-smart college kids destroying their tutor’s house through the ingenious use of popcorn, or simply used as an all-purpose 1980s signifier in Peter’s Friends. The song isn’t just interesting at a textual level though. If I were a music teacher, and I almost entirely lack the theoretical knowledge to ever be one (as this next section is likely to prove), I’d pull it out to explain to students how common time and triple metre can be laid on top of each other. The sheet music for Everybody stipulates 12/8 time at brisk 112 beats per minute. Yet what’s going on here is more subtle than that – it doesn’t really have the 1-2-3-1-2-3, 1-2-3-1-2-3 feel that 12/8 time would imply, at least not in the drums. The hi-hat part plays a shuffle (first and last beats of the triplets only), with the second beat of each triplet merely ghosted. The opening guitar riff is determinedly in triplets, but the melody of the chorus is square on-the-beat crotchets (replace the lyrics “most of freedom and of pleasure, nothing ever lasts for ever” with “one two three four, one two three four, one two three four, one two three four” to see what I mean). So there’s really three feels present at the same time, with the 4/4 shuffle coming out as the dominant feel (for me, at least – others will feel and play it differently, and if anyone versed in these things can explain it better, please do leave a comment) because the vocal melody insists on those four strong beats. It’s a masterly piece of writing, a great arrangement and one of the finest moments of a group not short of great songs. This entry was posted in Music and tagged 12/8, 1980s music, 4/4, Adam Curtis, Curt Smith, eighties music, Everybody Wants to Rule the World, Hunger Games, Lorde, movie soundtracks, Pandora's Box, Peter's Friends, Real Genius, Roland Orzabal, shuffle, shuffle feel#, signifiers, Sowing the Seeds of Love, Tears for Fears, The League of Gentlemen, time signatures, triplets, Val Kilmer on July 16, 2015 by rossjpalmer.